Evanston Township High School/District 202. Board members expressed concern over lagging literary preparedness. Daily file photo by Alison Albelda. 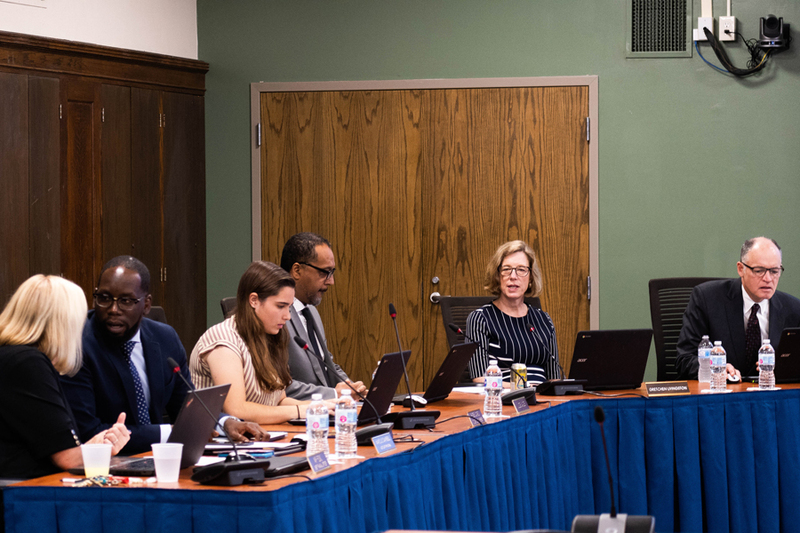 Evanston Township High School/District 202 board members voiced concerns at a meeting Monday over stagnating literacy levels and the progress of their joint literacy goal with District 65, criticizing the lack of consistency in literacy benchmarks. District 202 and Evanston/Skokie School District 65 created their joint literacy goal in 2014 to “ensure that all students are proficient readers and college and career ready by the time they reach 12th grade.” Scott Bramley, the associate principal for instruction and literacy at ETHS, said 59 percent of incoming freshmen score at or above grade-level in reading, according to results from the STAR — a standardized literacy test. “As an overall number, that’s pretty alarming to me, especially as someone whose only work is to focus on helping students,” Bramley said. However, Bramley said STAR only tells one half of the story. District 65 administers a different test to measure literacy for K-8 students: the MAP. According a report presented at the meeting by Bramley and Kiwana Brown, a reading specialist, while STAR scores find that only 59 percent of incoming ETHS freshmen are at grade-equivalent reading levels, MAP results indicate that 84 percent are proficient. Board member Jonathan Baum said the discrepancies between the MAP and STAR metrics make it difficult for District 202 to take measured steps to improve student literacy. Board member Gretchen Livingston added that District 202 and District 65 should work to be “singular” in how they approach measuring literacy. Still, Livingston emphasized both STAR and MAP results demonstrate the continuing problem of literacy in District 65 and District 202. Comparing STAR and MAP, Bromley said STAR’s more conservative estimate of the number of prepared students is more likely to be true. Bromley said while the Board of Education has implemented new programs like flexible scheduling and student-determined reading support, there’s still work to be done.